In recent weeks I have encountered some less-than-ideal sandwich offerings. This week, I’m happy to bring you a different sort of tale. On an inordinately rainy Los Angeles evening, I set out for a music venue, with hopes I may find a sandwich establishment before the beginning of the concert. The streets of West Hollywood were flooded, and roads closed due not only to the downpour, but also as a result of some sort of police manhunt. By the time I reached the block for the venue’s parking structure, I was only too happy to surrender my car to the valet and stop driving. I set out on foot in search of a place to eat. I headed two blocks west, but the heavy Boulevard left its businesses behind and became housing. I turned back around and headed east, hoping I wouldn’t have to resort to the upscale Japanese restaurant across the street. After another two blocks I spied, just up ahead, the familiar Boar’s Head logo in a storefront window. To my great delight, I had discovered Sunset Deli. This was an oasis of a sandwich shop. Priding themselves on their Boar’s Head-only meats and cheeses, they offer a wide range of sandwiches for hungry roamers like myself. I selected the Odies Hoagie, a curiously-named sandwich that features bacon, Black Forest ham, honey maple ham, “deluxe” ham, mayo, spicy mustard, lettuce, tomato, and onion on a white French roll. 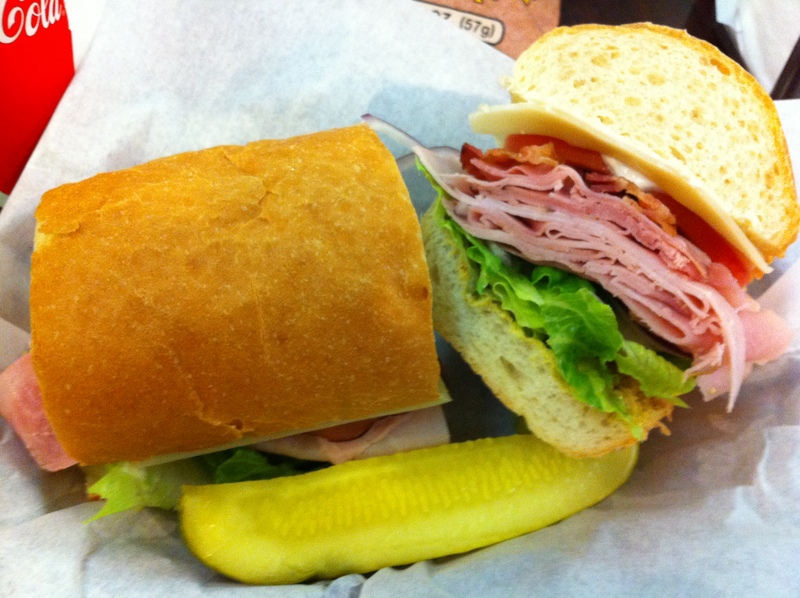 The ham, as in the photo above, is truly “piled high” unlike many establishments that make the same boast. After the first bite, I was in heaven. The true appeal of deli meat sliced thin is that it feels like light fare. The different type of ham blended together to provide definite substance, yet didn’t feel like I was eating an enormous meal. I settled in with a great sandwich and a great book and took shelter from the storm. Post-script: another item on the Sunset Deli menu caught my eye, and has captured the imagination of both myself and the esteemed founder of On Sandwiches. Stay tuned in the coming months for what may be the first On Sandwiches Special Event. This entry was posted in General Sandwich Discussion, Sandwich Reviews and tagged Deli, Los Angeles, Reviews by Bill, Sandwiches I Have Eaten by bengrimm. Bookmark the permalink. That is a wonderfully colorful sandwich. Very pleasing to look at.